There are few imperatives a father hears more often from his children than “watch me.” It’s a plea for us to recognize that whatever our son or daughter is doing — catching a ball, jumping off a diving board — is worthy of our full attention. They know we are often busy, often distracted and want, at least for a moment, for us to truly see them. By seeing them in action, they believe, we’ll appreciate them even more. 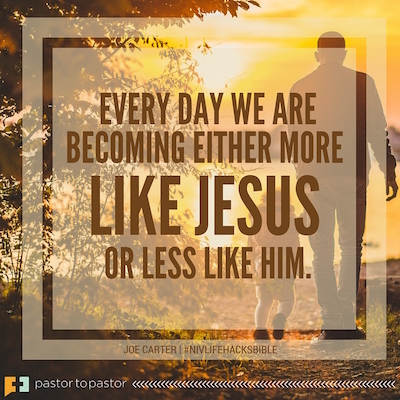 Be “watch-worthy” — Every day we are becoming either more like Jesus or less like him. Which direction are you headed in today? Because your children are watching you, that is also the direction you are leading them. If we want to be similarly “watch-worthy” we ought to dedicate ourselves to developing a broad range of godly habits. We must practice the core spiritual disciplines of prayer and intake of Scripture. But we should also be engaged in service and hospitality, evangelism and self-reflection, character formation and developing wisdom, etc. And, above all, we must daily learn to trust and obey God in all things. Let them see you in action — When do your children see you pray or read Scripture? Do they only see your bow your head to say grace at the dinner table? Do they only see you open your Bible in the Sunday morning church service? Are all your other times of prayer and devotion done behind the closed door of your office or bedroom? If so, then your children may assume such spiritual disciplines are to be practiced alone and in private. Find ways to let them see you in talking to the Father and engaging with his Word. And welcome their interruptions. Don’t be dismissive when they ask what you are reading. Explain to them — in language they can understand — what you are learning about God and why it’s important to you. Love their mothers — We live in a broken world and many of us live in broken families. But if you are blessed to be married to the mother of your children, show them what it means to be a godly husband. Click here to read more about forming godly habits with a free 7-day reading plan from the NIV Lifehacks Bible.